In this episode of NASA Now, you’ll visit NASA’s Spacecraft Propulsion Research Facility, called B-2, at NASA Plum Brook Station. You’ll meet Dr. Louis Povinelli and Brian Jones who explain why rockets are built in stages and the importance of testing a rocket before it is sent into space. B-2 is the world’s only facility capable of testing full-scale upper-stage launch vehicles and rocket engines under simulated high-altitude conditions. The engine or vehicle can be exposed for indefinite periods to low pressure, low temperatures, and dynamic solar heating. This simulates the harsh environment of space the hardware will encounter during orbital or interplanetary travel. Are you looking for ways to engage your students in exploration of the solar system? Bring the moon into your classroom — with technology. The Moon in Google Earth was developed jointly by Google, the NASA Ames Intelligent Robotics Group, the Japan Aerospace Exploration Agency and the SETI Institute as part of NASA’s Planetary Content project. Already have Google Earth 5? Select Moon from the top toolbar to start exploring. Go to NEON today to learn more about Apollo landing sites, 3-D models of spacecraft, and how this virtual window provides a 360-degree look at the moon’s surface. Use technology to help engage your students in NASA Explorer Schools content modules such as Exploring Space Through Math: Lunar Rover; Lunar Nautics: Designing a Mission to Live and Work on the Moon; and Math and Science @ Work: Lunar Surface Instrumentation. Read more about using technology in your classroom in NEON. Register, log in, join the NASA Explorer Schools group and find the Technology Tips forum. The complete write-up on exploring the virtual moon and other exciting uses of technology in the classroom will be available in that forum. In the Water Vapor Satellite Imagery lessons, your meteorology students learn how to identify and analyze jet streams using water vapor imagery from weather satellites. There is a jet stream tutorial if you need a better understanding of “jet stream.” Then your students can complete each of the learning scenarios in the order listed below. The Meteorologist’s Challenge: A TV meteorologist challenges you to locate the jet stream axis using water vapor imagery. A Crisis in the Air: An airline pilot needs your help in analyzing data from water vapor imagery and weather models to plot a new flight path to take advantage of a jet stream. Launching and Tracking a Weather Balloon: A team of weather researchers needs you to decide whether or not to launch a weather balloon by analyzing water vapor imagery and other weather data. Read more about these activities in NEON. Register, log in, and join the NASA Explorer Schools group and Satellite Meteorology forum. The complete write-up on the lessons is available in that forum. What Do Paper Airplanes, Skydivers and Baseball Have in Common? What a great way to bring anticipation and excitement to a family night event. Engaging your community through partnerships with your school to support NASA and science, technology, engineering and mathematics content opportunities is also a great way to earn recognition. How can you start building local partnerships in aviation? Contact a trained Federal Aviation Administration volunteer. The FAA has trained Aviation Education Counselors who have an interest in sharing their expertise and knowledge of aviation with students, teachers and the public. Requests for presenters and speakers may be obtained by written request through the Aviation Education Programs office in your region. Visit their website for more information. Author John EntwistlePosted on February 23, 2011 Categories UncategorizedTags General1 Comment on What Do Paper Airplanes, Skydivers and Baseball Have in Common? In this episode of NASA Now, Dr. Hal Maring joins us to explain why the upcoming launch of the Glory satellite is so important to further our understanding of climate change. He also will speak on the dual purposes of the Glory mission and dispel some misconceptions about climate change and global warming. Over the past several decades, environmental awareness has become one of our most prevalent issues. As Earth’s climate change becomes more rapid, the need to understand the causes and implications of this change becomes more urgent. Many theories exist connecting solar irradiation, aerosols and greenhouse gases to global climate change. While we know a lot about atmospheric greenhouse gases, there is still much to understand about their long-term effect on climate and other factors that may affect change. Next month, MESSENGER will execute a 15-minute maneuver. placing the spacecraft into orbit around Mercury. It will be the first spacecraft ever to orbit the solar system’s innermost planet. Check out the MESSENGER module Staying Cool — My Angle on Cooling to prepare your students for this event. Have your students look at some of MESSENGER’s science objectives and some of the challenges facing the spacecraft. Let us know about your activities with your students by posting on NEON. Read more about how to prepare your students for this event in NEON. 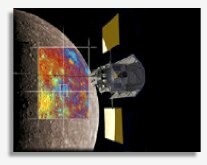 Register, log in, join the NASA Explorer Schools group, and find the MESSENGER Mission to Mercury: My Angle on Cooling forum. The complete write-up is available in that forum. For more information about the MESSENGER spacecraft, visit the mission website. Are you hoping to become eligible to receive NASA Explorer Schools teacher recognition and have the opportunity to attend a multiday research experience at one of the NASA centers this summer? To be eligible for NES recognition, complete one of each of the three core activities: a classroom teaching material, an e-professional development session, and a NASA Now event with your students. Do you know you can track your progress toward eligibility on the Virtual Campus? To follow your progress on completed activities, sign in to the Virtual Campus and click on the “My Activities” button in the left-hand navigation panel. There you will find the name, type and date of each completed activity. Activities are logged into your Virtual Campus record once you complete the associated survey found on the Virtual Campus activity page. If you do not see one of your activities in your record, you may have forgotten to fill out the survey. You may go back to the activity page and fill out the survey to get credit for your work. If you would like help selecting appropriate resources to complete your eligibility requirements, please feel free to call the help desk 800 number, send e-mail to the help desk, or join one of our Live Help Desk sessions, Office Hours, on Thursdays at 8 a.m., 12 p.m. and 5 p.m. EST. One of the NES educational specialists can help you identify resources that meet the needs of your classroom curriculum. NES teacher recognition applications must be submitted by close of business on March 31, 2011, so complete your final activities and apply for the exclusive opportunity to be recognized by NES for your dedication to the project. In this episode of NASA Now, George Hatcher, guidance, navigation and controls engineer at Kennedy Space Center, explains why the upcoming launch of the space shuttle Discovery is mind-boggling from a physics perspective, even for a guidance, navigation and flight controls engineer. He will speak about the extreme accelerations and velocities involved in launching a spacecraft from Earth to orbit and return. After 38 missions to date, and more than 5,600 trips around Earth, Discovery has flown more missions than any other shuttle — more than any other spacecraft. At the conclusion of STS-133, 180 people will have flown aboard Discovery, including the first female shuttle pilot and the first female shuttle commander, who happen to be the same person — Eileen Collins; the first African-American spacewalker, Bernard Harris; and the first sitting member of congress to fly in space, Jake Garn. Discovery will be the first of the shuttle fleet to retire.